DC Police deployed tear gas on Donald Trump protesters who had gathered outside the President-elect’s pre-inaugural party, the ‘DeploraBall’. Washington DC’s Metropolitan Police clashed with the large crowd that gathered outside of the sold-out event at the National Press Club Thursday evening. RT’s Alexander Rubinstein, who was at the scene, reported being hit by a pepper spray grenade and said the entire block filled with gas as protesters and riot police came to blows. 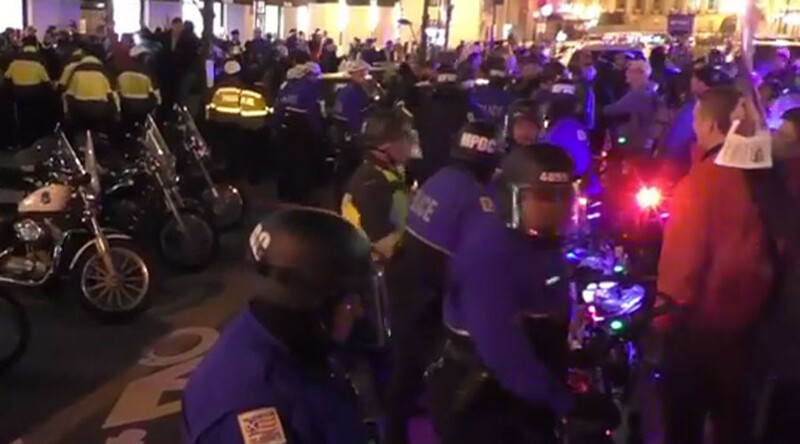 In an attempt to break up the demonstrators, officers deployed tear gas and pepper spray grenades – in response, protesters threw posters, water balloons and even a bike at police. The inauguration party was attended by 1,000 so-called “deplorables”, a label Trump supporters have embraced since Democratic candidate Hillary Clinton’s campaign trail remark that "you could put half of Trump's supporters into what I call the basket of deplorables."